Protests sprung out throughout the nation in response to the unexpected election of billionaire Republican and reality TV star Donald Trump. 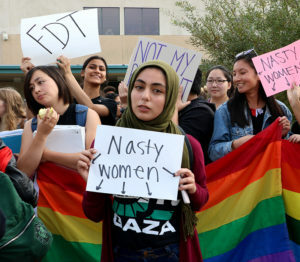 Major cities held large protests that spread onto high school campuses in response to the upcoming Republican presidency and the conservative leadership that threatens the livelihoods of millions. CVHS students protested on Nov. 10 to express their concerns with the president-elect. Hundreds of students began to collectively walk out of class at 8:30 a.m. on the second day after the election. About 200 students congregated in the quad. Many had signs with the slogan “Not my President.” They began chanting the slogan that has been a recurring theme throughout nationwide anti-Trump protests. “The protest seemed to mostly be an expression of general dissatisfaction, of the fact that many groups feel they weren’t respected or represented by this election,” said Ricci Teefy, president of the LGBT+ club, Gays and More. As more students began to join the group, they started to run around various parts of campus, attracting much attention from first period classes still in session. They ran around the gym a number of times before making a move to enter hallways. Administration began locking the hallway entrances to avoid disrupting teachers and students in class. Many protesters attempted to leave campus, but most decided against it, saying that they would be safer if they remained on campus. After break, the administration held a voluntary assembly in the gym, but the students who attended quickly exited. Then students assembled in front of the Center for the Arts, mainly for its size, accessibility, and visibility. During lunch, a protest held by the club Woke CVHS continued on the courtyard. 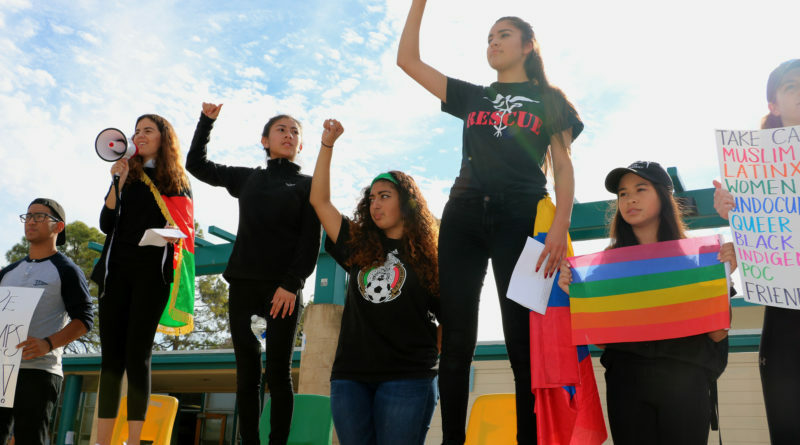 “The most memorable moment was when one student stood up and asked us to have a moment of silence in honor of those who had already hurt or killed themselves because of the results of the election,” said Quijano. The group of about 50 fell silent as they reflected on the severity of their present situation. Students of all grades participated in both protests, linking arms, chanting, and sharing in the collective energy. Many viewed the protests as an outlet for their frustrations, but others found time to think deeply on the possibility of a Trump presidency. “I wanted to let my peers know that I care about changing our country,…I am glad I participated, because the environment felt very loving and accepting, which is exactly what I needed at the time,” Quijano summarized. Students left the protests to return to an unpredictable reality, but felt assured by the community of people at CVHS there to support them. “Although this wasn’t the president I was hoping for, I hope we can come together for the greater good of our nation,” said Sanzo-Davis.